The JoshNAH Lightweight Double Camping Hammock is a complete set hammock system. That means that it comes with everything that you need to hang your hammock. You will get the double hammock, tree straps and carabiners. Some other brands of hammocks do not come with the straps nor carabiners, so keep that in mind when comparing prices. We have done all the work for you to find out if this is the camping hammock for you. Make sure to take a look at our review of the our Top 10 Camping Hammocks as well. The step up is quick and easy with the JoshNAh Lightweight Double Camping Hammock. Ropes can take a lot longer unless you are very skilled with tying knots. Because this hammock comes with straps and caribiners you can have this set up in a matter of a couple of minutes. Several of the people who bought this hammock commented that they could set it up in under a minutes time. You can also easily adjust the height of the JoshNAh Lightweight Double Camping Hammock by simply moving and clipping the caribiners to the strap loops. The tree straps have 13 loops in them so adjusting to the height that you'd like is very simple. This is a nice feature that many of the competitor hammocks don't have. Sometimes you don't realize the comfort of how you hung your hammock until you lay down and try it out. Then to take it all down and set it up again can be a pain, if you don't like the height. So these 13 loops are definitely a real bonus feature. This hammock is made from 210T parachute nylon. Both the tree straps and hammocks have 3 stitches on every single seam. This is a quality that most of the competitor hammocks also have. Triple stitching on the hammocks is a nice feature because it will insure that your hammock won't come apart at the seams. With any stitched material from clothes to hammocks, products will most often rip first at the seams. The triple stitching means that the JoshNAh Lightweight Double Camping Hammock is made to last for many years. As far as the feel of this hammock, it is soft and silky to the touch. This is the nature of the parachute hammocks. The material also breaths and is washable in cold water. Because of the nature of this fabric, it will not retain warmth. So if you plan on camping with this hammock on a cool or cold day, make sure to put a camping pad underneath you and use a warm sleeping bag. On the flip side of this feature is that on a warm or hot day, this material will allow you to feel breezes. It won't retain not trap sweat. The JoshNAh Double Hammock has a weight load capacity of 500 pounds. It will fit 2 to 3 adults just so long as you don't go over the recommended weight load. Some people have fit parents and their young children in this hammock all at the same time. Two people can lay down side by side in this this hammock, though for sleeping I'd recommend each person to get their own hammock. The nature of this type of hammock and parachute camping hammocks in general is that they will cocoon around you. It may be fun for a short amount of time with two people but after a few minutes, you will notice that maneuvering around in tight quarters with the sides of the hammock hugging you is going to be a challenge with more than one occupant. Also, for two people, it's really best to sit up with your feet out. Definitely for 3 people sitting with feet out is how you will all fit the best. If you are a large person, this hammock may be just perfect for you to use alone. There have also been small and average sized adults that said they loved the extra room in the double hammock. The nice thing about this hammock is that you have options, just so you don't go over the recommended 500 pound maximum weight capacity. 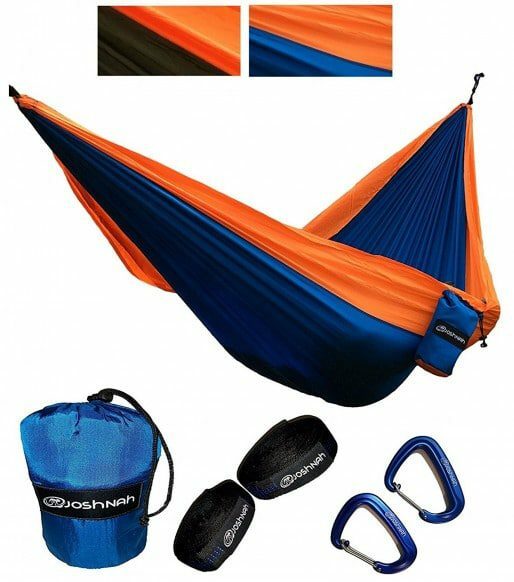 With the JoshNAh Lightweight Double Camping Hammock you get two choices, either blue and orange or dark green and orange. For other double wide hammocks some offer only one color choice, which really isn't a choice. But some competitor hammocks offer many color choices. If you don't like orange you are out of luck here. But if you do like orange you can choose the dark green or blue to go with it. This hammock is guaranteed to please you or you will receive your full refund back. This is a quality that every hammock company should offer. And in all fairness most of the competitor hammocks also carry a 100% money back guarantee. For the tentative or first time hammock buyer this should make you feel better. You really have nothing to loose by giving this hammock a try. A bag is attached to the hammock. It's stitched right on to the hammock. This is a nice feature because when it's time to pack up the hammock, you won't need to wonder where you put your hammock bag. Another nice thing about the bag attached is that it will hold your cell phone and a snack while you are hanging in your hammock. The competitor hammocks that I've reviewed also have this feature. It seems to have become an industry standard. I haven't come across anyone yet that said they did not like this feature. The hammock bag will hold the hammock, carabiners and straps. All that you need to hang your hammock is made to fit in the bag. The bag when stuffed, will be about 2/3 the size of a football. If you are looking for a super small hammock with bag and supplies, you can actually find ones that are smaller than the JoshNAh Lightweight Double Camping Hammock. This hammock is right about in the middle ground on size. Some are smaller while some are much bigger. The JoshNAh Lightweight Double Camping Hammock is priced in the middle of the other hammocks of this type. The Eno Double Hammocks are going to be much pricier and also not include straps like this one does. But if you are looking for the least expensive hammock out there, you can find cheaper ones that still are triple stitched, come with carabiners, straps and a bag. There are some very satisfied customers that bought this hammock that say this is the best one for the price. Here are some top questions that I found for people considering buying a JoshNAh Lightweight Double Camping Hammock. Will this hammock last for more than one camping season? Yes. This hammock is made to last. It is triple stitched so it will not come apart at the seams even when used a lot. It should last for many camping seasons and many years. Can I get this without the orange color? No. At this time the JoshNAh Lightweight Double Camping Hammock only comes in green and orange or blue and orange. I've never used nor set up a hammock before. Will this be hard for a novice to figure out? This hammock sets up very easily and fast. Even a beginner can hang this hammock. The JoshNAh Lightweight Double Camping Hammock is a quality hammock at a price much less expensive than some of the competitor double camping hammocks. It has the same qualities except that the stuff hammock bag is slightly larger than the more expensive double camping hammocks. Unless you are an ultralight backpacker or wanting the smallest hammock to carry, the JoshNAh Lightweight Double Camping Hammock is a good choice for the price in my opinion.